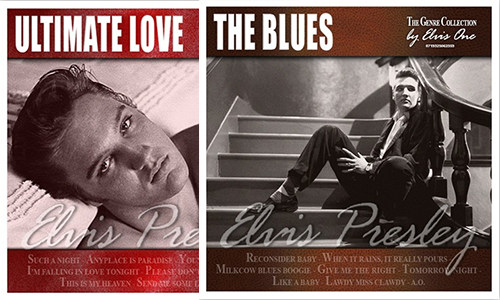 The Elvis One label announced two new compilations, "Ultimate Love" and "The Blues". “Ultimate Love” and “The Blues” are the first two CD releases from “The Genre Collection”. Each CD in this collection contains the original masters and alternate recordings, including recordings previously unreleased by Elvis’ record company. “Ultimate Love” contains the original mono single master from “I’m Yours”, take 16 of “Please Don’t Stop Loving Me”, a 1959 homerecording of “Send Me Some Lovin’” and 27 other great songs. On “The Blues” you can hear the complete take 3 of “What’d I Say”, the song “Hound Dog” in stunning sound quality! A total of 25 songs. 01 Such A Night 02 Anyplace Is Paradise 03 Stuck On You (Original Mono single master) 04 All Shook Up (Including count-in) 05 Fever 06 I Want You With Me 07 Young And Beautiful 08 I’m Falling In Love Tonight (Alternate take 5) 09 Please Don’t Stop Loving Me (Alternate take 16)* 10 It’s Now Or Never (Original Mono single master) 11 Gently 12 Can’t Help Falling In Love (Movie version, take 9)* 13 I Need Your Love Tonight 14 Surrender 15 Loving You 16 I’m Yours (Original Mono single master) 17 Where Do You Come From (Binaural master)* 18 I Want You, I Need You, I Love You 19 Paralyzed 20 Blue Moon (Original Sun master) 21 Wear My Ring Around Your Neck (Undubbed master) 22 (Let Me Be Your) Teddy Bear 23 Any Way You Want Me (That’s How I Will Be) 24 This Is My Heaven (Alternate take 5)* 25 Home Is Where The Heart Is (Alternate take 20)* 26 One Night 27 First In Line 28 Love Me Tender 29 Because Of Love (Binaural master)* 30 Send Me Some Lovin’ (Homerecording, 1959)* * Previously Unreleased by Elvis’ Record Company. 01 Reconsider Baby 02 I Feel So Bad 03 When It Rains, It Really Pours (Original Sun master) 04 Milkcow Blues Boogie (Original Sun master) 05 So Glad You’re Mine 06 Mean Woman Blues 07 My Baby Left Me 08 Tomorrow Night (Original Sun master) 09 Trying To Get To You (Original Sun master) 10 New Orleans 11 Trouble 12 It Feels So Right 13 Beach Boy Blues 14 Like A Baby 15 Lawdy Miss Clawdy 16 A Mess Of Blues (Original Mono single master) 17 I Want To Be Free 18 Give Me The Right 19 Anyplace Is Paradise 20 I Need You So 21 My Baby’s Gone (Original Sun master) 22 Hound Dog (From the original master tape) 23 What’d I Say (Alternate take 3)* 24 Santa Claus Is Back In Town 25 Blue Christmas. OMG how many CD releases will the Dutchies ElvisOne release? Don't we have this stuff already?